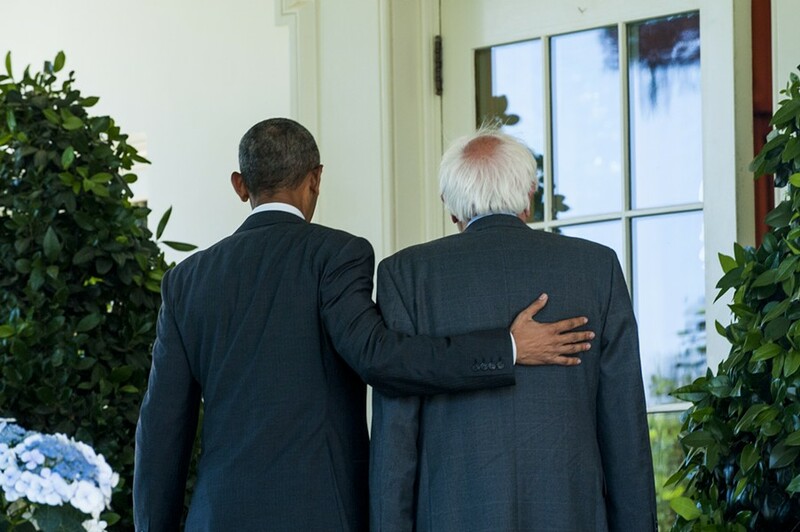 President Barack Obama and Sen. Bernie Sanders walk past the Rose Garden Thursday on their way to an Oval Office meeting. President Barack Obama sought to bring the Democratic presidential primary to a close Thursday, endorsing former secretary of state Hillary Clinton in a video address. Obama unveiled his long-anticipated endorsement just 90 minutes after meeting with Clinton’s persistent rival, Sen. Bernie Sanders (I-Vt.), in the Oval Office. 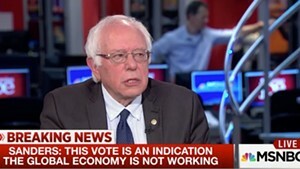 When Sanders emerged from the White House, he told reporters he planned to continue campaigning through next week’s primary in Washington, D.C., and to fight for his platform at the Democratic National Convention in July. Sanders did not immediately offer Clinton his own endorsement, but he indicated that he would help her defeat the GOP’s presumptive nominee. “I will work as hard as I can to make sure that Donald Trump does not become president of the United States,” he said. Two days after Clinton declared victory in their hard-fought nominating contest, Sanders spent much of Thursday shuttling between meetings with Democratic heavyweights. He returned to Capitol Hill after a long absence to confer with Senate Minority Leader Harry Reid (D-Nev.) and Sen. Chuck Schumer (D-N.Y.). Later, he dropped by Vice President Joe Biden’s house. Throughout the day, Sanders ignored questions about the timing of his expected withdrawal from the race, and he avoided discussing his rival. At a rally that night outside RFK Stadium, he didn’t mention Clinton’s name at all. But everybody else in Washington was talking about the presumptive nominee. In an appearance Thursday night on MSNBC’s “The Rachel Maddow Show,” Sen. Elizabeth Warren (D-Mass.) announced her own support for Clinton. Warren, a darling of liberal activists, had refrained from picking sides throughout the contest. Even as she endorsed Clinton, Warren hailed Sanders’ contribution to the race, noting that she stood for many of the issues he championed. Obama did the same in his video endorsing Clinton. He praised Sanders for running “an incredible campaign” and highlighted the senator’s focus on income inequality and campaign finance reform.